Advantages: Excellent surface detail; well thought out engineering that makes assembly a lot easier than it could have been; informative instructions; perfectly registered decals with minimal carrier film. Disadvantages: Oil cooler missing but mentioned in instructions; some casting/curing issues. 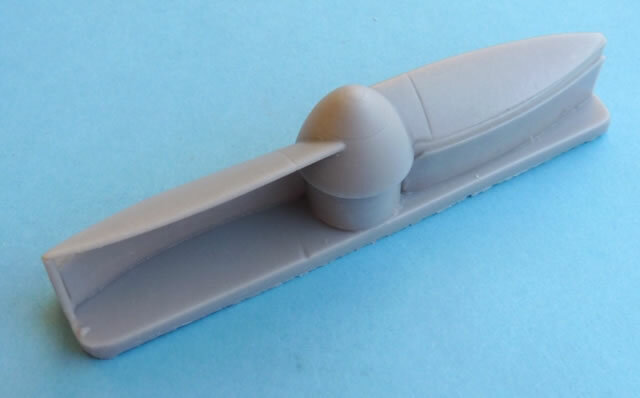 Conclusion: A well thought out resin conversion set that allows the modeller to convert Eduard’s 1:32 scale Bf 109E into the earlier “Berta”. Despite the helpful instructions, modelling experience will be needed to execute the transformation. 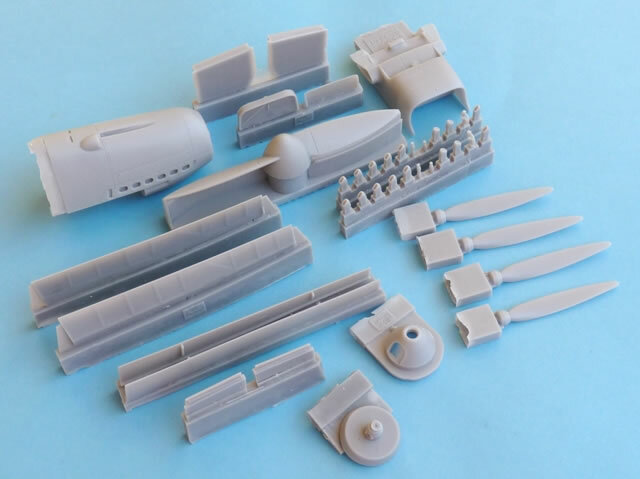 This isn’t the first conversion kit that Alley Cat has designed for the Eduard Bf 109E series, but it is the most ambitious so far. It’s intended to backdate the “Emil” into either a Bf109B-1 or B-2. The recommended kit to do this with is the E-1 but with a little bit of extra work, the E-3 will also be possible. Inside the box are 41 grey coloured resin parts and a sheet of decals to cover 4 aircraft. The former features lovely surface detail with not a hint of an air bubble in sight. The task at hand is a pretty complicated one so modelling experience will be necessary. The instructions provided with this set consist of 4 A4 pages and combine both text and step by step construction photos. This leaves little to the imagination and provides a good guide for the prospective builder. First off, one has to remove the radiators from beneath the wings and Alley Cat supplies the replacement inserts for this. The rivet and panel detail match that of Eduard’s kit precisely so careful work will ensure a perfect match. For those that choose to use the E-3 as a basis, you’re got a harder task on your hands as you must also remove the bulges associated with the wing guns. Naturally a new front-end is required to encase the Jumo 210D engine and this one-piece casting is superb. 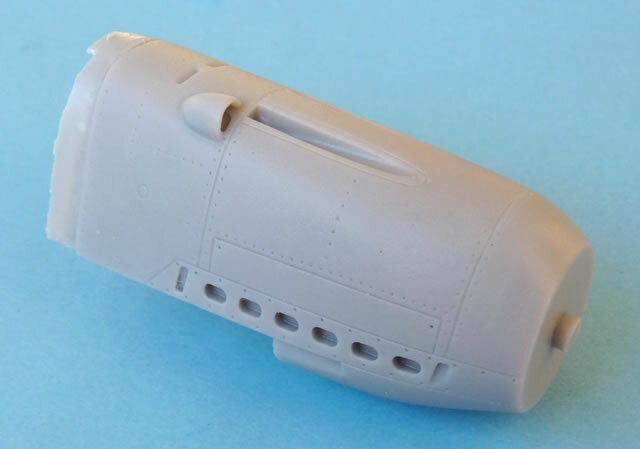 Take note that this part may have to be modified depending on which “Bf 109 B” you choose to model. Difficult surgery will be required should you choose a subject that has the 3 slots cut into the forward upper part of the cowl. The associated radiator is also a nicely produced item and simply slides beneath the aforementioned nose. The final attachment to the donor kit is straight forward enough, once the corresponding slot has been cut away from Eduard’s one-piece lower wing. There are various panel details that will have to be filled and/or scribed. This is all indicated on the instructions with measurements being given in millimetres to make sure no mistakes are made. A new oil cooler is needed for the lower surface of the wing and apparently one is contained in this release. Sadly it was absent from my example (Editor's Note - A2Zee Models will replace any defective or missing parts). The longer leading edge slats are supplied, as are replacements for the flaps and ailerons. If any of these parts are warped to the extent that the opposing tips appear at different heights, then the solution is simple. Just dip the offending parts in hot water and reshape. Mine were fine, however an issue with the supplied flaps was much more problematical...the leading edges, and consequently the trailing edges, were curved. This is not the result of any technical problem when the masters were created. 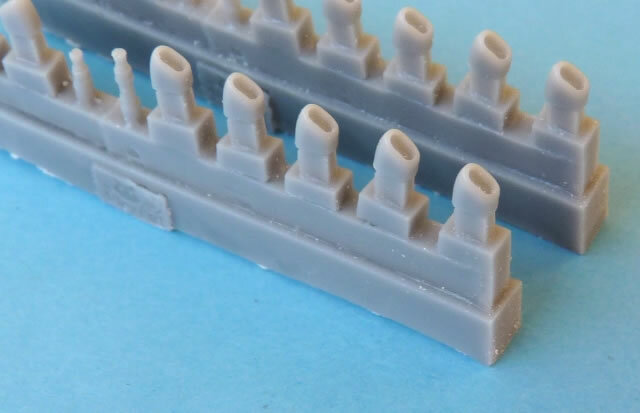 It’s more related to the execution of the casting and curing process. Unfortunately the only solution here is to graft the better portions with those of the plastic kit. “Bertas” could be found with both wooden Schwarz fixed pitch propellers and the later VDM two bladed variable pitch types. Alley Cat caters for both of these. They also provide a new spinner and backing plate for the latter item. Separate exhaust stubs are another welcome feature (seen on one of the four options) as is the correctly styled control column grip. 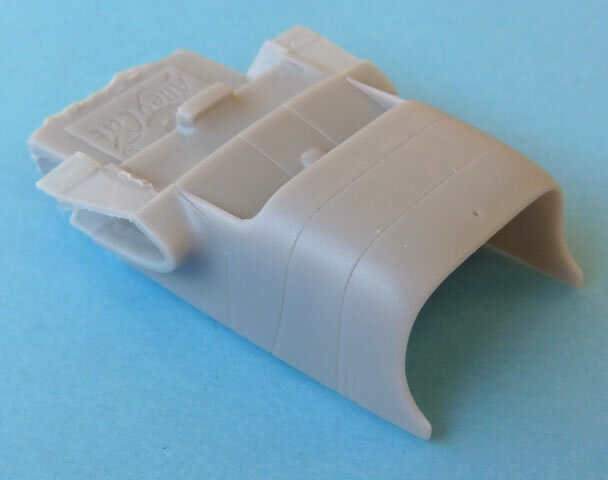 Other areas of the cockpit that differed from the “Emil” will have to be researched and replicated by the modeller themselves. 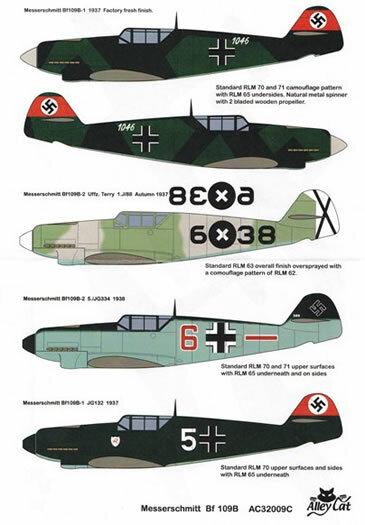 There are 4 aircraft to choose from on the decal sheet. 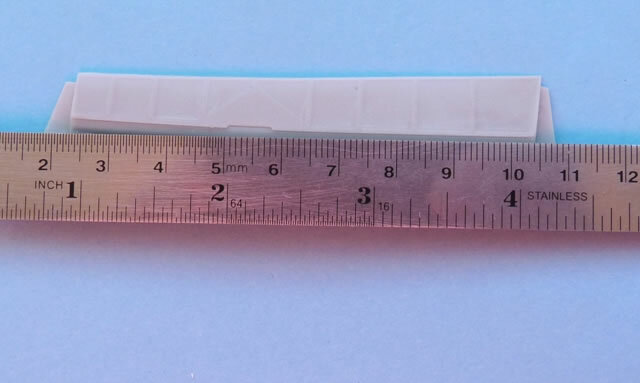 The markings are in perfect register and each was surrounded by a minimum of carrier film. This is a great conversion set that allows the modeller to build a variant of Messerschmitt’s famous fighter that one normally wouldn’t see in this scale. The detail is up to the same standard as Eduard’s offering so the final result should be seamless. Sadly my example was let down by some quality control issues and one can only hope that it’s an isolated case. Some experience will be needed to carry out the conversion but it’s nothing a little patience won’t fix. 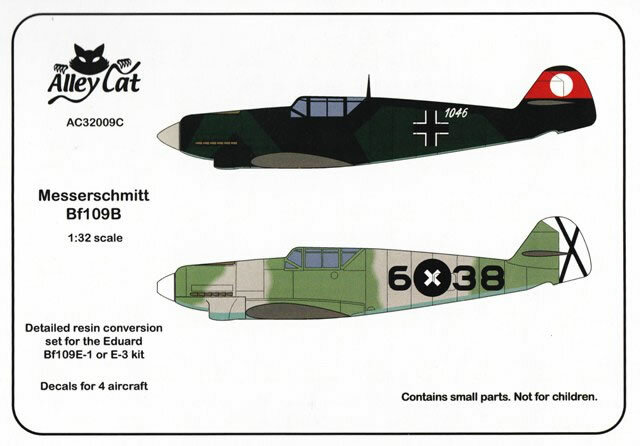 The result will be an impressive and novel addition to your display of 1:32 scale Luftwaffe aircraft.